High value interbank payments in the UK are routed through CHAPS, the country’s high value payment system. Anyone who has bought a house in the UK has probably used CHAPS, but CHAPS has a wide range of uses outside of house purchases. Banks use CHAPS to settle a variety of high value payments, including some time-critical payments (such as margin calls on centrally cleared products, and unsecured sterling loan payments). Importantly, CHAPS is a Real Time Gross Settlement system which means that every CHAPS payment needs to be pre-funded; this makes it liquidity-intensive. So, if a bank failed to settle a CHAPS payment, its receiving counterparty might put it in default. It is therefore crucial that CHAPS banks have enough liquidity to make their payments. What are the sources of liquidity in CHAPS? Reserves held at the BoE. Intra-day loans (IDL) from the BoE which are collateralised against a small range of high quality securities. Incoming payments which are received from other participants in the CHAPS system (known as “recycling”). We think of reserves and IDL as banks using their “own liquidity” since this carries an opportunity cost. This is because the bank in question could have placed the cash held on its reserves account or collateral pledged with the BoE in a more profitable investment elsewhere. 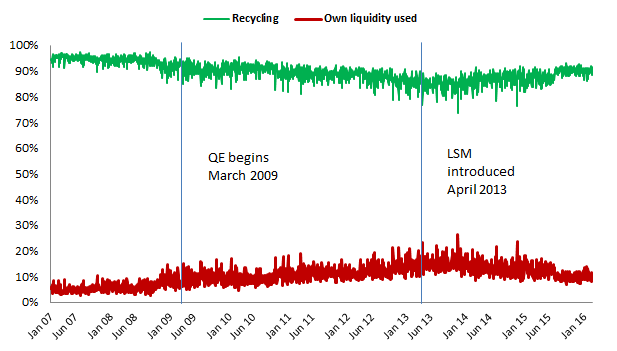 On the other hand, recycling liquidity is pretty much costless. Although recycling liquidity may involve delaying outgoing payments until incoming payments arrive, there is no financial penalty for doing so. Banks may face a degree of operational risk associated with delaying payments – because they increase the window for a technical fault to occur – and there might also be a small reputational cost because customers may not want their bank to delay their payments. Nevertheless recycling payments is still the cheapest source of liquidity as it carries no opportunity cost for the bank making payments. 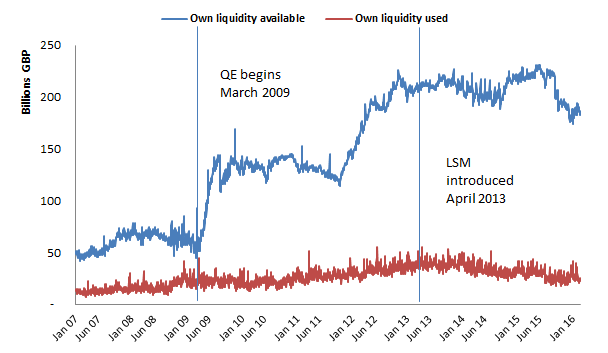 How has QE changed the availability of liquidity in CHAPS? As part of its QE programme, the BoE bought gilts from a wide range of institutions, which led to an increase in the amount of cash held at banks by those institutions. In turn, this means that the banks have increased their reserves with which they can (among other things) fund CHAPS payments. 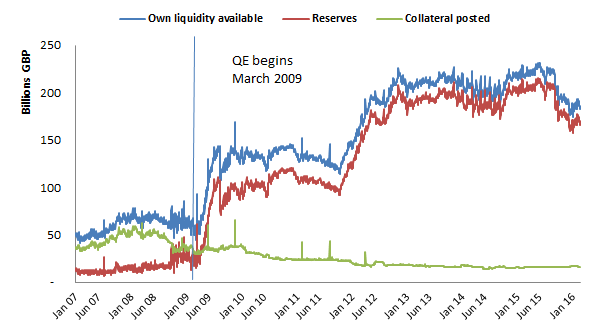 Chart 1 shows that QE has drastically increased the amount of reserves and therefore the available own liquidity. 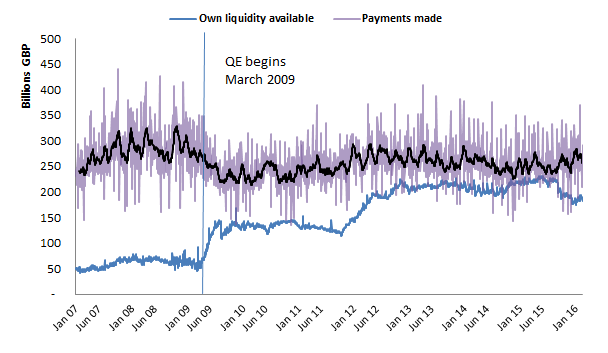 Chart 2 compares banks’ available own liquidity with the amount of CHAPS payments actually being made. It shows that banks now have nearly enough liquidity to fund almost all outgoing payments without recourse to recycling. You might then expect CHAPS banks to be using these additional reserves to fund their CHAPS payments. “Reserves” represents the total amount held in CHAPS banks’ reserves accounts. “Collateral posted” represents the amount of collateral pledged with the BOE by CHAPS direct participants to generate intra-day liquidity. “Own Liquidity available” is the sum of reserves and collateral posted. Payments made: The purple line represents the daily value of payments and the black line represents their 15-day moving average. “Own Liquidity available” is the sum of reserves and collateral posted. Do CHAPS banks rely on their high reserves balances to make payments? To see if this is the case, we calculate the total amount of own liquidity used across CHAPS banks. This is just the sum of the largest net debit position of each bank (i.e., the maximum value of payments sent minus payments received by each bank) on a given day. Chart 3 compares own liquidity available with own liquidity used to fund CHAPS payments. It shows that although liquidity available to the banks shot up, liquidity used didn’t increase by anything close to that. We would expect if banks had begun relying on the additional liquidity afforded to them by QE to fund their CHAPS payments, liquidity used would increase in line with own liquidity available. To see how CHAPS banks fund their payments, we then compare the amount of own liquidity used with the total amount of payments made. Any amount of payments made in excess of own liquidity used is by definition attributed to recycling. Chart 4 shows the proportion of payments made that are funded by “own liquidity” (i.e. reserves and/or IDLs) and by recycling. It is clear that banks use own liquidity to fund a small proportion of CHAPS payments with the bulk of payments being funded by recycling. More importantly however, banks have pretty much carried on with this behaviour after QE commenced and despite the high levels of reserve balances. Interestingly, participants in “Fedwire” (the high value payment system in the US) have been relying much more on their reserves balances since the QE programme in the US started according to a Liberty Street article. “Own liquidity available” is the sum of reserves and collateral posted. “Own liquidity used” is the sum, across CHAPS banks, of their maximum net debit position attained during the day. The fraction of CHAPS payments funded by “own liquidity” is the ratio of “own liquidity used” over total payments made. The fraction of CHAPS payments funded by “recycling” is one minus that ratio. Why do CHAPS banks continue to recycle their payments to such a large degree? First, CHAPS banks must comply with “throughput rules”. These require banks to settle a certain proportion of their payments by the required monitoring times in the day. CHAPS banks often bunch their payments around these monitoring points, meaning they are receiving a lot of payments at the same time as they are sending them. This naturally results in a degree of liquidity recycling. A relatively small number of banks that are direct (first tier) CHAPS participants, offer access to a large number of customer (second tier) banks. This highly “tiered” network reduces the total amount of “own liquidity used” and also allows the direct banks to recycle liquidity more efficiently because they receive a larger value of payments on behalf of their indirect clients which can be re-used for other clients. The literature on liquidity usage in High Value Payment Systems (e.g. Becher et al. and Galbiati & Soramaki) shows that all three of the factors we talked about above contribute to liquidity recycling. But it’s difficult to pin down the individual contribution made by each factor. The fact that CHAPS banks mostly rely on liquidity recycling to make payments is good news. This is not only because recycling incoming payments is the cheapest way to fund outgoing ones but mainly because banks’ ability to make payments has not become dependent on their reserves balances. So, their ability to make payments should not be affected in any way in the event that QE is unwound. Evangelos Benos works in the Bank’s FMI Risk, Research and CCP Policy Division and Gary Harper works in the Bank’s FMI Supervision Division. Previous Post Have reforms to the BOE’s operating framework reduced money market volatility, and does this matter for monetary policy transmission?